A GARDEN centre has removed signs which encouraged boys to climb trees and girls to have tea parties over accusations they were sexist. 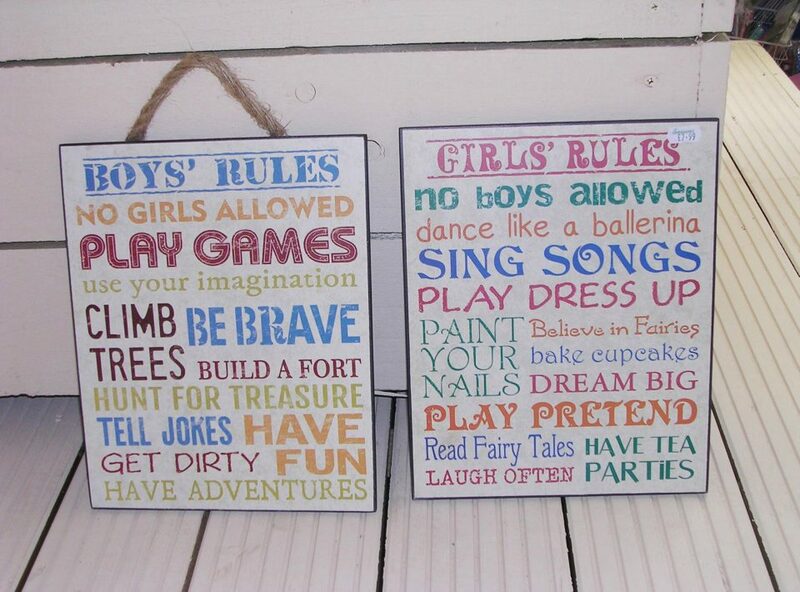 The decorations also suggested boys should get dirty while their female counterparts should bake cupcakes. Grandmother Gilliam Elton-Wall complained about them, saying they perpetuated “unhealthy” stereotypes. The 74-year-old said: “I was really shocked to see them. "The items, no doubt intended to decorate a child's bedroom, seem to me to confirm very dated and unhealthy gender stereotypes, not at all suitable for 2017. "They suggest that whilst boys are active, positive and dynamic, girls are merely passive, decorative and domestic. "Do we really see girls in this negative and patronising way in the 21st century? Made from wood, the signs are around 30cm tall and 24cm and were on sale at Garsons in Titchfield, Hants for £7.99. The boys' rules include be brave, hunt for treasure, tell jokes and have adventures. While the girls' rules say dance like a ballerina, have tea parties, laugh often, and play dress up. Gilliam, who has an eight-year-old granddaughter, added: "I don't want people telling my granddaughter what she should do to be a proper girl like painting her nails and baking cupcakes while boys are climbing trees, building forts, and going on adventures and doing all the exciting things in life. "As a teacher I hope that all children will use their imagination, be brave, climb trees and have fun. "I don't think gender stereotyping of this nature is acceptable. I believe girls should have equal opportunities as boys. "But these posters were so blatant in their stereotyping, when side by side the contrast between rules was huge." The signs were removed following the complaint by Gilliam from Lee-on-the-Solent, Hants. She added: "I was very pleased as I sent an email in the evening and I got an instant response. "They didn't waste any time in removing the product and I was delighted to hear of the immediate action in withdrawing the product." Garsons' director Ben Thompson said: "There was a product that a customer alerted us to and we have now swiftly removed it." I am proud to say as a leading promoter and teacher in the sport of recreational tree climbing, I was always completely gender-neutral. If a girl wanted to climb, I was as happy to help as for any boy. When young eyes light up with eager excitement as was shown in the recreational tree climbing documentary "Tickle the Sky", it doesn't matter whether they're boys or girls.